The National Book Development Council, NBDC, has inaugurated the Bate Besong Memorial Library in Tiko, Southwest Province, to honour Cameroon's fallen poet and dramatist, Dr. Bate Besong. The NBDC officially opened the library of the Imperial Academy of Arts and Science, IMPAAS Tiko, which has been named after Bate Besong, while commemorating the International Book Day on April 23 with the school. The launching, which took place at IMPAAS, also saw the donation of consignments of books to the institution by NBDC members. IMPAAS Principal, Henry Tabe Abang, described the twin occasion as memorable. To him, christening their library after an academic icon in the calibre of late Dr. Bate Besong is a big challenge. "The challenge is that we shall use that same library to produce another Bate Besong in the subsequent years. We shall not delay in making it become an enviable centre for the acquisition of knowledge," Tabe said. Appreciating NBDC's book donation, IMPAAS Proprietor, Stephen Mbu, said it was not only a kind gesture but also timely. "The NBDC donation has provided the fuel and the steam for the library's take-off," he remarked. Mbu invited the students of IMPAAS to read and write like Bate Besong, adding that Besong was not only a firebrand lecturer at the University of Buea, but he was a prolific writer of English Literature books. "No other name for this library could have been more befitting," Mbu quipped. NBDC Chairman, George Ngwane, said his project, Mobile Library or Books on Wheels, is to promote a book culture among the youths, with emphasis on the girl child. He said it is also to equip libraries that would provide access to education and literacy to the youths. 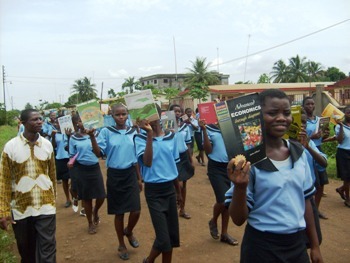 Drawing inspiration from the Ghanaian publisher, Richard Crabbe, Ngwane quoted; "If education is the road out of poverty, then books are the wheels needed for the journey." Ngwane explained that the NBDC contribution is to energise the epileptic indigenous book sector, especially in the face of cultural imperialism and the revolution of the internet industry. To the students of IMPAAS and beyond, the NBDC chair told them; "We're out to encourage your quest for knowledge, to satisfy your ambition to be successful in life, to shape your values and visions of a new society that our generation has loaned from you. Indeed, to celebrate and immortalise the written word, for in the beginning was the word and the word was with God and the word was God." The consignment of books NBDC donated were of diverse subjects with fifty titles by Anglophone Cameroon writers such as Sammy Oke Akombi, Churchill Ewumbue-Monono, Agnes Fri, Comfort Ashu and Dibussi Tande. Meanwhile, Idenau Council located in the West Coast District, marked this year's World Book Day, with a new library.The Mayor of the council, James Elonge Esange said the close to 1,000-book library will go a long way to facilitate the acquisition of knowledge and boost efforts at research by students, pupils, teachers and the entire lot of people in Idenau. "Idenau now has a library. It will be good for the students of GHS Idenau, Sar/SM and others to make ample use of it," the Mayor said. "You know we are in the rural area and we have to develop a stronger reading habit if we must succeed," he added. Esange said a good chunk of the books that make up the new library was the fruits of an accord signed with the British Council a few years back. Besides, others came through the Buea-based writer and political critic, Mwalimu George Ngwane. The books, according to the Public Relations Officer of Idenau Council,Raphael Muma, cover a wide range of fields and subjects: sciences, medicine, design and technology and the arts. The librarian, Charles Nanyiam Ndum, gave a historical account of the library, the importance of books and printed materials. The Acting Inspector of Basic Education for the West Coast, Mrs. Juliet Kemmer Nanyongo, on her part called on parents to try to encourage their children to make good use of the library and implored the teachers not to keep off the library. It seems like Bate Besong is still alive because we can still feel his presence by seeing individuals who continue his pledge. I am haunted by his last interview where he said, "Everyday I leave my house...my family knows...for the past twenty years...when I leave my house I know I will not come back home. Every play I write, Any poem I write, I write as if it is my last poem, as if it is my last book." It's like he knows the risks, fatal risks, and still he writes what he knows is right.